Women dancers from the Hyottoko dance group, dressed in traditional straw hats and yukata. In all, the Hyottoko group has 100 members, including men and children. Held every summer on the last Saturday and Sunday of August in the Koenji district of Tokyo, the Awaodori is a dance festival of almost unimaginable scale. 12,000 dancers and musicians from almost 200 dance groups parade along the streets of the neighbourhood. Over the course of the weekend, 1.2 million people come to watch and take part in the festivities. Awaodori is a traditional form of dance that originated over 400 years ago in Tokushima on the island of Shikoku. Legend has it that the dance form emerged spontaneously after Lord Hachisuka Iemasa distributed free sake (rice wine) to celebrate the completion of Tokushima Castle in 1586. This resulted in drunken people dancing in the streets, and inventing a new dance in the process. No-one is really sure if the legend is true or not, but there has certainly been an annual Awaodori festival in Tokushima for hundreds of years. 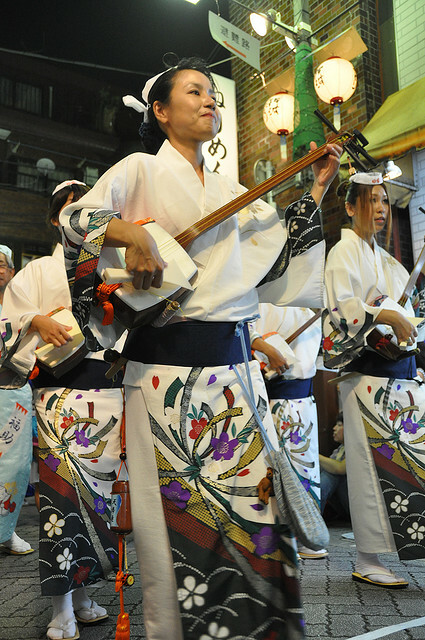 These women are playing the shamisen, a kind of three-stringed lute. Nowadays, it’s even bigger than the one in Tokyo, being attended by 1.3 million spectators. If you are interested in the Tokushima event, check out the official website (in Japanese), or the Japan National Tourism Organization’s guide. As I’ve never been to Tokushima myself, I’m going to write about the Koenji event instead. Koenji Awaodori started as a small local festival in 1957, but it now attracts dance groups from all over Japan. The original event took place in a shopping arcade next to the station, but its huge size means that eight more parade routes have been added, so the total performance space is now about five kilometres long. The groups of dancers advance along a straight line, performing the Awaodori dance as they go. They’re accompanied by musicians playing lively music, many of whom dance themselves. 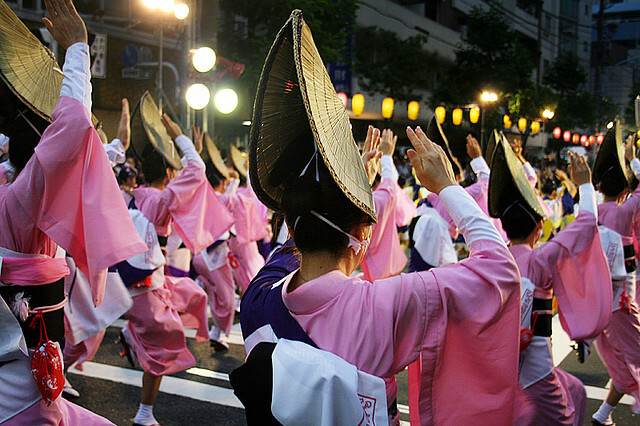 The Awaodori dance is also known as the fools’ dance, due to the lyrics of the accompanying song: ‘The dancers are fools; The watchers are fools; Both are fools alike so; Why not dance?’ Some groups strictly follow the traditional dance moves and accompanying music, but others prefer to innovate. There are different steps for men and women. The women’s dance is supposed to be elegant and harmonious, with beautiful tiptoe steps, and aims to display the glamorous flexibility of the dancers, but the men’s dance is variously described as displaying dignified elegance, liveliness, or wildness. Many groups include both men and women, who perform the two different steps, although sometimes everyone does the men’s dance. Children sometimes perform along with adults, but there are also children-only groups and adult-only groups. 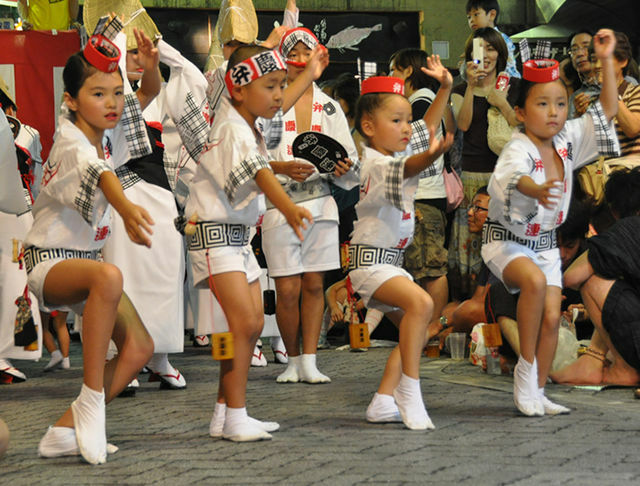 Children usually perform the male version of the dance, but their performances are focussed on expressing exuberance and youth. The age range of the performers taking part in the festival is impressive. 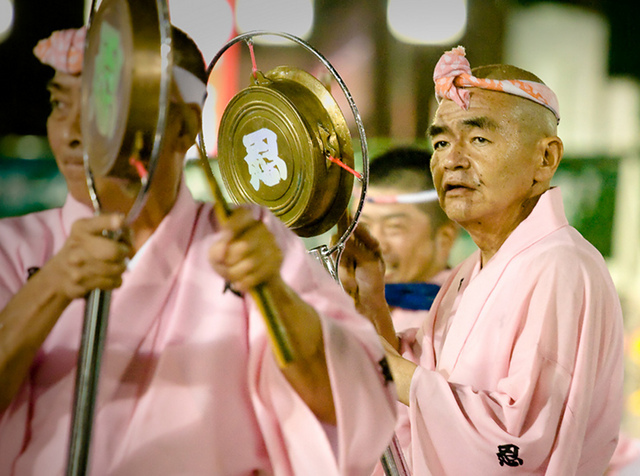 These men are playing kane, a traditional kind of bell that is also used in Buddhist and Shinto ceremonies. Some of the groups have introduced innovations, such as adapting the dance to mimic a butterfly in flight, or incorporating lanterns carried by the dancers. Part of the fun of the festival is seeing the different interpretations each group has of Awaodori dancing. The musicians parade along with the dancers, usually playing the lively Awaodori music on traditional Japanese instruments such as shamisen lutes, taiko drums, shinobue flutes and kane bells. On top of this, the dancers chant and sing as they parade, meaning that the event is as much an auditory experience as it is a visual one. 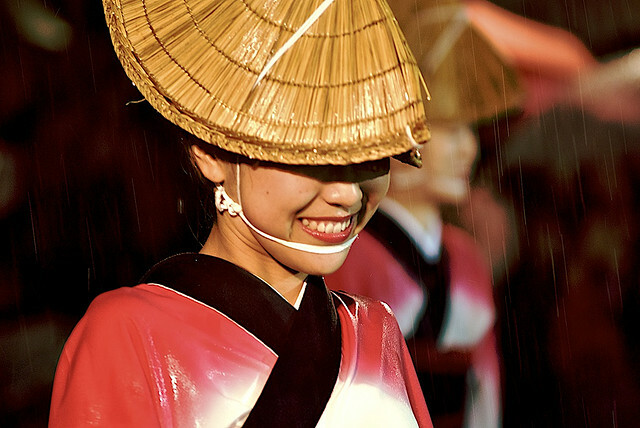 All the performers dress in traditional Japanese clothes, though each group has its own style. Most distinctive are the semi-circular star hats worn by the women dancers, who also wear yukata (informal kimono) and geta (wooden sandals). Men and children usually wear happi jackets, shorts and split-toed tabi socks. The pouring rain doesn’t seem to have dampened this dancer’s spirits. The overall impression that you get is one of boundless energy and contagious enthusiasm. Your ears are bombarded with the distinctive Awaodori rhythm as a seemingly never-ending stream of dancers passes before your eyes. As many of the parade streets and shopping arcades are narrow, you come really close to the performers, adding to the intensity of the experience. Tokyo in August is hot and very humid, so it’s a miracle that anyone has the energy to dance at all, let alone keep it up for hours. Sometimes it rains torrentially, but this doesn’t put a stop to the action – spectators just put up umbrellas, and performers are probably just glad of the chance to keep cool. Visitors are not allowed to dance during the event, but there’s a bit of an impromptu free-for-all once it’s over. If you get hungry, there are plenty of food stalls on the side streets. The tastiest options are the Japanese snacks, such as yakitori (barbecued chicken) and takoyaki (octopus dumplings). The festival usually takes place from 6:30 to 9:30pm, but Koenji turns into one big party afterwards, which for some people is almost as big an attraction as the music and dancing. Some of the festival’s youngest performers. They are dressed in the happi jackets, shorts and tabi socks traditionally worn by male dancers. For more details, check the official website. To get to Koenji, take the Chuo Line from Shinjuku (6 minutes) or Tokyo (22 minutes) stations. Rapid trains don’t always stop at Koenji, so you may have to change to the Chuo-Sobu Line (local) train at Shinjuku.